It's three for the price of one at this glamping getaway! Sleep in a vintage caravan, cook in a pretty cabin and dine on an outdoor terrace. Chestnut (‘Châtaigne’ in French) is so named because of the Chestnut trees that can be found deep in our woodlands and in the wider Dordogne area. Chestnut consists of a lovingly refurbished vintage 1974 Castleton caravan and a pretty wooden cabin built by us using timber from our own woodlands. The caravan has a comfy double bed and seating for two along with ample storage in cupboards, drawers and a wardrobe. There is a full size fridge with a freezer compartment and plenty of worktop space for food preparation. The cabin houses a comfy sofa, a cooking area with a 2-ring gas stove and small grill, a washing up area and a separate spacious shower room. The beautiful outdoor terrace has a dining area for 2 people, within a tranquil and stunning woodland/meadow setting - pure bliss! By building a cabin alongside the caravan we've enhanced the glamping experience by giving you more space and more amenities and we've fitted out and decorated the caravan and the cabin in a quirky and imaginative way. 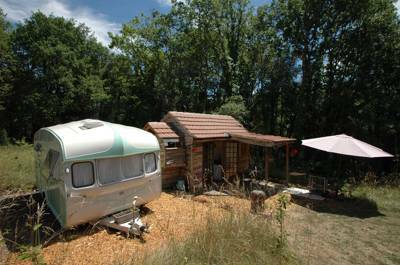 Luxury glamping in the idyllic Dordogne Valley. 2 x spacious (5 metre diameter) Bell Tents and 1 x beautifully refurbished vintage caravan. All have WiFi access; a private well-equipped kitchen with hob, grill and fridge; personal large shower room with electricity points; private outside dining area with barbecue; jute matting inside; super comfy beds; bed linen provided; solar powered lighting in tents and outside areas; shared swimming pool and sunbathing area. Welcome pack on arrival including: local wine, milk, bread, butter, tea, coffee and biscuits. Kayak, bike and canoe hire available on site. New for 2015, campers can also hire electric bikes. The beautifully preserved 14th century town of Sarlat is a pleasure to walk around, especially during the spring and autumn, or early in the morning. The centre of the old town consists of impeccably restored stone buildings and is largely car-free. Sarlat has many many restaurants, bars and cafes and one of the many joys of staying near Sarlat is discovering them! As well as Sarlat, the Dordogne region of France offers many attractions for visitors including the Cathédrale St-Sacerdos and the Château de Marqueyssac. La Blanquette is well equipped for cooking all your own food and there's no greater smell than than a BBQ mingling with the chestnuts and pines. Should you venture out, Sarlat has many restaurants, bars and cafes. You can't do the Dordogne without sampling some of the famous French cuisine. There is a restaurant, a farm shop (with freshly baked bread) and a health food store within walking distance (approximately 30 minutes walk). You can also get to us via train - Sarlat train station is only 5km away. There are two bell tents and one vintage caravan available. One of the tents, Truffe Noir, is dog friendly.